The cervical spine (neck) starts at the base of skull and extends down to the thoracic spine. The neck joins head with trunk and limbs and it works as a major conduit for structures between them. Flexibility of neck movement allows and maximise necessary positions for head functions and its sensory organs. There are many important structures in the neck area such as nerves, muscles, arteries, veins, vertebrates, lymphatics, glands, oesophagus and trachea. Due to these important structures and lack of bony protection at the neck region, it is considered as an area of vulnerability. The main arterial blood supply for the head and neck are carotid arteries and the jugular veins are the principal venous drainage. These blood supplies are commonly injured in penetrating wound of neck. The Brachial plexus originates from the neck and travels inferiorly to the upper limb. 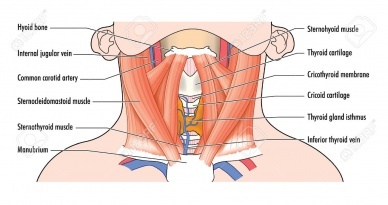 The thyroid cartilage (largest cartilage of thyroid and trachea) is located at the anterior aspect of the neck. 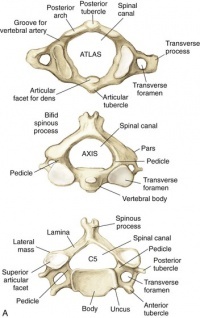 Superior cervical group: made up by C1 (atlas) and C2 (axis). Inferior cervical group: made up by C3 to C7. The first two cervical vertebrae differ considerably from the others. 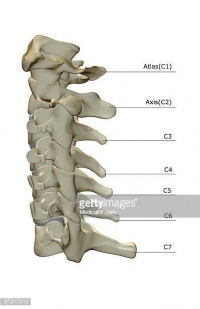 Axis, C2, has a vertebral body. It's most distinctive feature is the odontoid process or tooth which is placed vertically on the superior surface of the vertebral body with two articular facets (anterior and posterior) which articulate with atlas bone and atlas transverse ligament. C2 has a smaller and triangular vertebral foramen. 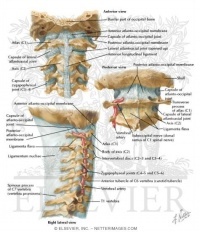 C3 to C6 has similar characteristics such as smaller vertebral body with spinous processes,two pedicles directed backwards and transverse process located anteriorly. Joints between vertebrae are made for spine mobility, Movements of superior cervical spine joint and inferior cervical spine joints functionally completing each others allowing movements like rotation,flexion,extension and inclination of head. Atlanto-axial joint : It compromise three synovial joints, one central atlanto-odontoid joint and two lateral atlanto-axial joints. It is formed by articulation of inferior facets of vertebrae and superior facet of adjacent vertebrae. Direction and range of movement of these joints depend on orientation of articular facets.These joints allow flexion, extension, rotation and lateral flexion. Degenerative changes at these joints are very common due to weight-bearing functions. Opinions are divided whether these structures are joints or pseudoarthrosis. The clinical significance of these structures is the high tendency of developing degenerative changes that may impinge vertebral artery,cervical nerve roots or anterior part of spinal cord.They allow for flexion and extension and limit lateral flexion in the cervical spine.They prevent posterior linear translation movements of the vertebral bodies,Important in providing stability and guiding the motion of the cervical spine. Anterior atlanto-occipital membrane: it connects between foramen-magnum above and atlas below, it continues with anterior longitudinal ligament. Apical ligament: it is short and attaches anterior part of foramen-magnum. Membrane of Tectoria: Connecting posterior surface of body of axis to the basiocciput. It is prolongation of posterior longitudinal ligament and it is found in internal surface of vertebral canal. Anterior longitudinal ligament : it is strong band lies anterior to vertebral body. It is relaxed in flexion and taut in extension. Posterior longitudinal ligament: it is posterior to vertebral bodies and lies in vertebral canal. It stretches in neck flexion and relaxes in neck extension. Ligamenta flava : It is yellow elastic tissue, it connects laminae of adjacent vertebrae. It allows flexion to occur and prevent hyper-flexion by breaking movement at end of range. Ligamentum nuchae: it is a fibro-elastic membrane which extends from occiput to spine of all cervical vertebrae. It helps in stability of head and neck especially in head flextion /acceleration injuries. It limits flextion and provides an attachment to Trapezius and Splenius capitis. It make about 25% of cervical spine height, there is no disc between occiput and C1 or between C1 and C2. 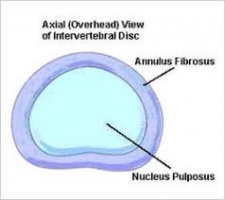 Intervertebral discs consists of both nucleus pulposus and annulus fibrosis. Although there are 7 cervical vertebraes,there are 8 nerve roots as there is a root between occiput and C1. The roots are named for the vertebrae below . ↑ 1.0 1.1 Lang, J., 1993. Clinical anatomy of the cervical spine. Stuttgart; New York: Thieme. ↑ Cervical Spine Anatomy. University of Maryland Clinical Center. 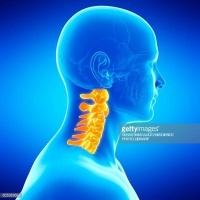 http://www.umm.edu/programs/spine/health/guides/cervical-spine-anatomy. accessed Apirl 2018. ↑ Spine, S.C., 2015. Anatomy of the Cervical Spine. Cervical Spine: Minimally Invasive and Open Surgery, p.1. ↑ Kim, D.H., Vaccaro, A.R., Dickman, C.A., Cho, D., Lee, S. and Kim, I., 2013. Surgical Anatomy and Techniques to the Spine E-Book. Elsevier Health Sciences. ↑ 5.0 5.1 Spine, S.C., 2015. Anatomy of the Cervical Spine. Cervical Spine: Minimally Invasive and Open Surgery, p.1. ↑ Ross, J.S. and Moore, K.R., 2015. Diagnostic Imaging: Spine E-Book. Elsevier Health Sciences. ↑ Jeffreys, E., 2013. Disorders of the cervical spine. Butterworth-Heinemann. ↑ 9.0 9.1 9.2 Middleditch, A. and Oliver, J., 2005. Functional anatomy of the spine. Elsevier Health Sciences. ↑ Hartman J. Anatomy and clinical significance of the uncinate process and uncovertebral joint: A comprehensive review. Clin Anat. 2014 Jan 22. doi: 10.1002/ca.22317. ↑ 11.0 11.1 Magee, D.J., 2014. Orthopedic physical assessment-E-Book. Elsevier Health Sciences.